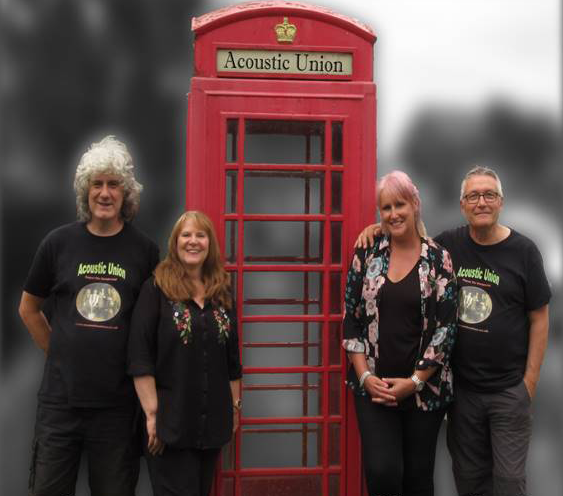 Acoustic Union are a four-piece band from the East Midlands area. The band was formed in early 2010 by musicians who each have about 30 years of experience in the music business. They produce acoustic arrangements of a wide variety of pop and rock classics, as well as their own material, bluegrass, instrumentals and traditional songs. The band have been influenced and inspired by musicians such as The Beatles, Abba, Eric Clapton, Jack Bruce, Alison Krauss and Union Station, Creedence Clearwater Revival, and many more. They use a wide variety of instruments including guitars, fiddle, dobro, banjo, mandolin, double bass, and ethnic percussion instruments, to give a rich and varied texture to the music.